Clarke County Hospital's Diagnostic Imaging staff is committed to providing excellent patient care and high quality imaging to facilitate your physician in providing an accurate diagnosis. Our staff members are all registered technologists and have completed extensive education and training in their field. We have state-of-the-art digital equipment that rivals metropolitan hospitals. Ultrasound imaging uses a transducer or probe to generate sound waves and produce pictures of the body's internal structures. It does not use ionizing radiation, has no known harmful effects, and provides a clear picture of soft tissues that don't show up well on x-ray images. Ultrasound is often used to help diagnose unexplained pain, swelling and infection. It may also be used to provide imaging guidance to needle biopsies or to see and evaluate conditions related to blood flow. It's also the preferred imaging method for monitoring a pregnancy and an unborn child. 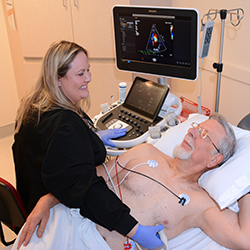 Clarke County Hospital just acquired the new Affiniti 70 Ultrasound by Philips in 2015 and was the first Imaging Department in the Midwest to have it installed and available to patients. The Affiniti 70's intuitive design will be extremely beneficial in serving the local community because it provides the hospital's practitioners with higher quality imagery and efficiency while delivering enhanced comfort and diagnostics to our patients; keeping Clarke County Hospital on the cutting edge of technology. X-ray or radiography uses a very small dose of ionizing radiation to produce pictures of the body's internal structures. X-rays are the oldest and most frequently used form of medical imaging. They are often used to help diagnose fractured bones, look for injury or infection and to locate foreign objects in soft tissue. Some x-ray exams may use an iodine-based contrast material or barium to help improve the visibility of specific organs, blood vessels, tissues or bone. CCH utilizes digital radiography that can produce an image in just a few seconds. Computed tomography (CT) is a diagnostic imaging test used to create detailed images of internal organs, bones, soft tissue and blood vessels. The cross-sectional images generated during a CT scan can be reformatted in multiple planes, and can even generate three-dimensional images which can be viewed on a computer monitor or transferred to electronic media. CT scanning is often the best method for detecting many different cancers since the images allow your doctor to confirm the presence of a tumor and determine its size and location. CT is fast, painless, noninvasive and accurate. In emergency cases, it can reveal internal injuries and bleeding quickly enough to help save lives. At CCH, we have a 64 slice CT scanner which speeds up the exam time significantly when compared to the more commonly used 16 slice scanners. 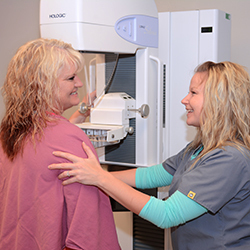 Mammography is a specific type of breast imaging that uses low-dose x-rays to detect cancer early-before women experience symptoms-when it is most treatable. Mammography plays a central part in the early detection of breast cancers because it can show changes in the breast up to two years before you or your physician can feel them. The American Cancer Society (ACS), the American Medical Association (AMA) and the American College of Radiology (ACR) recommend annual mammograms for women over 40. The National Cancer Institute (NCI) adds that women who have a personal or family history of breast cancer should talk to their doctor about when they should begin screening. Bone density scanning, also called dual-energy x-ray absorptiometry (DEXA) or bone densitometry, is an enhanced form of x-ray technology that is used to measure bone loss. DEXA is today's established standard for measuring bone mineral density (BMD). DEXA is performed on both hips and the lower spine. DEXA is most often used to diagnose osteoporosis, a condition that often affects women after menopause but may also be found in men and rarely in children. Osteoporosis involves a gradual loss of calcium, as well as structural changes, causing the bones to become thinner, more fragile and more likely to break. Magnetic resonance imaging (MRI) uses a powerful magnetic field, radio waves and a computer to produce detailed pictures of the body's internal structures that are clearer, more detailed and more likely in some instances to identify and accurately characterize disease than other imaging methods. It is used to evaluate the body for a variety of conditions, including tumors and diseases of the liver, heart, bowel, joints, and spine. MRI is noninvasive and does not use ionizing radiation. CCH uses a mobile service for MRI that is here on Mondays and Fridays. Nuclear medicine imaging uses small amounts of radioactive material, a special camera and a computer to create images of the inside of your body. It provides unique information that often cannot be obtained using other imaging procedures to help diagnose many types of cancers, heart disease, gastrointestinal, endocrine, neurological disorders and other health conditions. Because nuclear medicine procedures are able to pinpoint molecular activity within the body, they may detect disease in its earliest stages when it is most easily treated. CCH uses a mobile service for Nuclear Medicine that is here every Tuesday. Positron emission tomography (PET) uses small amounts of radioactive materials called radiotracers, a special camera and a computer to help evaluate your organ and tissue functions. By identifying body changes at the cellular level, PET may detect the early onset of disease before it is evident on other imaging tests. CCH uses a mobile service for PET/CT and they are here on an as needed basis.